massages in paradise. No big deal. April, 2014 - So we may have recapped our recent St. Barths trip in the form of filling you in our new bestie, broken down how to get in a seriously sweat-inducing work-out despite being on vacation (and yes, our idea of vacation typically involves being half-asleep on a beach somewhere, cocktail in hand too). We also gave you the lowdown on how to cook some seriously mean tilapia tacos. All that, and we still somehow have yet to actually wax poetic on the breath-taking, ripped-straight-from-a-brochure-like beauty of St. Barths. As if the whole inescapable, decidedly French thing that permeates life on the island weren't enough, it's the journey that only adds to the general sense of elusiveness of the island. No, actually, we mean the actual flight you have to take to get there. 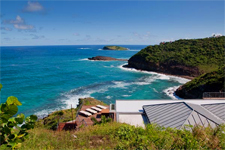 Did we not mention that the St. Barths airport has been dubbed the third most dangerous in the world? Because that's totally a thing. Lucky for us, we were flown in from San Juan by Tradewind Aviation- on a teeny-tiny eight-person plane, no less. Upon landing, we were greeted at the (again, impossibly glamorous and impossibly French) airport in St. Barths by our hosts from WIMCO Villas, who rent private villas and apartments everywhere from St. Barths to St. Tropez, Florence and Cabo. We were picked up by our WIMCO concierge, Moe (hi, Moe!) and Cecilia, where Moe helped us retrieve our rental car and took us to our villa, only to be greeted by our very own personal concierge- yes, you're reading that correctly. Here we are, debating between rent payments and half-price Saint Laurent, but we had our very own concierge at our beck and call when needed. Totally normal. Staying at the next-level elegant Villa WV JEP (each villa on the island has it's own little code...cute, right? ), a stunning six bedroom villa practically hanging over the ocean, we instantly began to make ourselves feel at home A.K.A. checking out the fridge. Anticipating a very empty albeit very fancy fridge, you can imagine our surprise when we were instead greeted by a very full (still fancy) one instead. So who can we call our culinary fairy godmothers? The WIMCO team had actually pre-arranged to have our kitchen stocked with groceries and prepared meals from a local grocer, Mayas To Go. Oh, and side note on the whole French colony thing? All of the groceries - yes, even fruits and vegetables - are imported from France. Karl would totally approve. Even better- Virtually every grocery store has an array of the most painstakingly delicious bread and cheese, like, ever- so much so that we could actually shed a tear thinking about it. That good. Oh, and there are more fine wine stores than there are groceries. Honey, we're home! Oh, but the part that really kind of cemented the fact that we need to find a way to make the island our permanent residence, language barriers and immigration issues be damned, was the part where WIMCO arranged for massage therapists from a local spa, Ligne St. Barth, to come and help us out. We even had our massages on the villa's deck, overlooking the ocean and needless to say, we could really get used to that sort of thing on the regular. The spa is also behind the beauty products (the usual shampoo, conditioner, and body lotions) provided to guests during their stay, and we swear that it actually had us shelving the Kerastase we lugged across the border for the week. That, and the photoshoot we had at Villa WV WIK, designed by Olivier Dain Perspectives. Did we mention there was a personal chef, too? ...Is it bad that we're looking up prices for flights back right now?